Many are surprised when they learn that there is an Orthodox church in Ashland. Archangel Gabriel’s has been here, though, in one form or another, since the late 1970s. It began when a handful of believers, with no place to worship, began meeting at their own houses to celebrate major Church feast days. “We just took things into our own hands,” says Olga Kline, one of the founders. Their persistence soon attracted the attention of Orthodox clergy in the region. Fr. David Fox, Tatiana and Ax. Beginning in 1985, priests began visiting the area, celebrating Liturgy while here. From 1988 to 1996, Fr. George Gray, rector of St. Nicholas Cathedral in Portland, visited every six weeks, holding services in the local Episcopal church. At this time they were known as the “Ashland Orthodox Christian Mission.” Later, Fr. 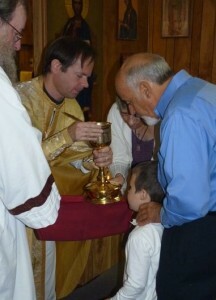 David Shank, another Portland priest, assumed care of the mission, holding services every two weeks. Fr. David Fox, the mission’s first permanently assigned priest, arrived in 1997. His ministry, which especially enhanced the church’s proficiency in singing, was cut short by a fatal heart-attack in December of 1998. “He had the voice of an angel,” said one parishioner, “and sang the services from the depths of his heart.” It was under Fr. David that the mission received its present name of Archangel Gabriel’s. After the repose of Fr. David, Fr. Isaac Skidmore became the parish priest. 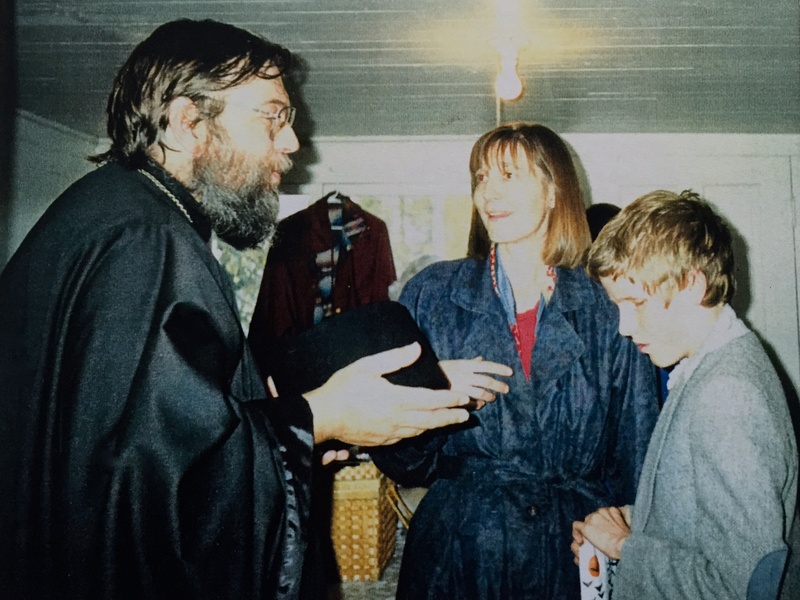 Together with his family, he arrived in August of 2000, after attending St. Vladimir’s Seminary in New York. Fr. Isaac worked diligently in the parish for over a decade, and welcomed many new members into the community. His loving ministry has left a permanent mark on the community, and his faithful labor bore much fruit in the hearts of his flock. Since 2008, Fr. Isaac has also worked as a counselor in the Rogue Valley. Fr. Andreas Blom and his family arrived at Archangel Gabriel’s in the summer of 2012, after graduating from St. Tikhon’s Seminary in Pennsylvania. In December 2014, the parish was able to purchase almost 7 acres of land right by I-5 in Ashland. In April, 2015, the parish moved to a larger temporary space in Phoenix, OR, as the our community continues to grow and prepares to build a permanent Orthodox temple on our own property in the near future. May God grant many years of grace to His flock in Southern Oregon, and great mercy to all who visit and share with us in worship! The Orthodox Church in America (OCA), of which Ashland’s Archangel Gabriel Orthodox Church is a part, was formed in 1970, when the Patriarch of Moscow signed a declaration granting self-governing powers to the Russian church in America (which had already, in 1924, declared itself to be temporarily independent of the Russian mother-church, suspecting that her decrees reflected growing Communist interference). The body’s new name, Orthodox Church in America, conveys its unique mission: the first of the world’s Orthodox churches devoted primarily to the American population, governed by a hierarchy that resides on American soil. As such, Archangel Gabriel’s Orthodox Church hosts fully English services, and its members are primarily those who were not themselves born into or raised by Orthodox families.